We can’t explain everything, of course. The Bible is a big book, and its pages invite a lifetime of study. But this quick, introductory tour will help you see how the Bible fits together and how its basic themes are developed. When we’re finished, these hundreds of pages won’t seem quite so mysterious. We hope this tour will whet your appetite to come back and explore more thoroughly. It is important that you follow this tour with a Bible at hand. Make sure that the Bible you will be using is complete. Any Bible that contains both the Old and the New Testaments will be suitable for this quick tour of the Scriptures. So if you’re ready, let’s start by looking at the cover. In addition to the words Holy Bible, you’ll probably see a designation of which version you have. If your Bible is older, it most likely is what is known as the Authorized or King James version, because it was prepared and published under the patronage of King James VI of England in 1611. Or if you are in the Roman Catholic tradition, it may be a Douay-Rheims Version. 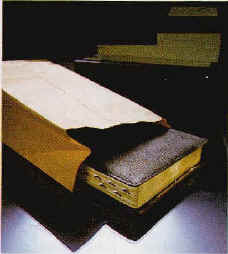 Or your Bible may be an updated version, such as the New International Version, the New Revised Standard, the New American Standard, the New King James, the New English Bible, the Revised English Bible, and the New Living Translation, or you may have yet another of the many versions available. In this series of articles, we are using the New International Version as our reference. If you are using another version, you may find the wording slightly different, but the other essential features will be the same. Now look at the title page. Under the title you’ll see words such as Containing the Old and New Testaments, showing that the Bible is divided into two main parts. (Some Bibles include other sections, too, but we will stick to the most common two-part arrangement.) 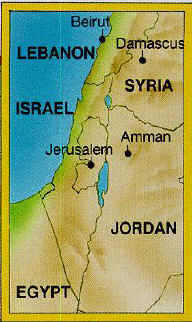 The Old Testament tells of events from the creation of humans to a time about 400 years before Jesus Christ was born. An important theme is the rags-to-riches-to-ruin-to-rebuilding story of ancient Israel. These people lived in the Middle East. The New Testament, much shorter than the Old, contains the four Gospels, each recounting the life and teachings of Jesus Christ. The Gospels are followed by the Acts of the Apostles, which tells the story of the first years of the Christian church. The New Testament also includes many of the letters (known as “epistles”) written by the apostles. It concludes with the Apocalypse or Book of Revelation. 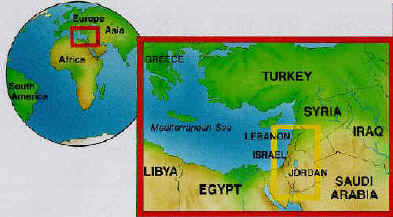 The Bible looks at the world from the perspective of the Middle East. Both testaments of the Bible are important. The writers of the New Testament presumed that their readers were familiar with the Old. You cannot fully understand the New Testament except with some knowledge of what is in the Old, and the Old Testament is incomplete without the light of what is in the New. You also may notice, on the title page, a paragraph that reads something like this: Translated out of the original tongues and with former translations diligently compared and revised. Hebrew and Aramaic were the original languages of the Old Testament. The New Testament was originally written in Greek. What you are looking at is a translation. After the title page, you may find a list explaining abbreviations and perhaps a pronunciation guide for some of the unfamiliar names and places. There may also be a few pages of introduction or a preface from the publishers. Most King James Bibles reproduce the letter of dedication by the translators in honor of their royal sponsor. These prefaces and forewords are interesting, but they are not part of the actual text of the Bible and need not detain us now. Next, you should find a table of contents listing the various books of the Bible in order. The word Bible derives from a Greek word, biblon, which means “book.” The Bible is actually a collection of many different writings, written over a period of about 1,400 years by 40 or more authors. And yet the books support each other in a coherent way, which is one reason people who believe and trust the Bible recognize it as God’s Word. From time to time on this tour, we will suggest you look at some short passages in the Bible. You will need to know how to find them. The Bible is a big book, and locating a specific passage, if you don’t know how to look, can be like searching for a needle in a haystack. Most Bibles have a table of contents near the front. This will help you locate a particular reference. The books have been further divided into chapters and verses. A citation will mention the book name, then the chapter number, a colon, and the verse number. For example, Deuteronomy 4:7 refers to the book of Deuteronomy (the fifth book in the Bible), the fourth chapter, the seventh verse. Some short (one-chapter) books have only verse numbers; 3 John 4-6 refers to the fourth through sixth verses of the third epistle of John, near the end of the Bible. When you come to a reference printed in bold in the text (like this), we suggest you find the passage and read it. It will make the tour more interesting and help you get the feeling and flavor of the Bible. We have also placed additional scriptural references in the graphics. There is no need to stop and read all these references during the tour. They are there to help you follow along as we progress through the Bible and so you can find your place if you get lost. A good guide doesn’t want to lose his tour group! You will find these scriptural references helpful if you decide to explore some parts of the Bible more thoroughly later. This book has been likened to an instruction manual from humanity’s manufacturer. It boldly claims that God created human life for a purpose. It tells us that God’s plan for us extends far beyond our years of physical existence. One of the best-known verses in the Bible is the so-called “golden verse,” from the third chapter of the Gospel of John: “For God so loved the world that he gave his one and only Son, that whoever believes in him shall not perish but have eternal life” (John 3:16). You’ve probably heard that before. But do you understand it? Why is humanity perishing? How does believing in Jesus Christ give us eternal life? What is it, anyway? In another New Testament verse, the apostle Paul reminds a young man, “From infancy you have known the holy Scriptures, which are able to make you wise for salvation through faith in Christ Jesus”(2 Timothy 3:15). In other words, the Scriptures contain all we need to know to be saved. But saved from what? Saved for what? Our tour of the Bible will look at these questions. So You’re Going to Buy a Bible? As we explained in the Introduction, almost any complete Bible can be used for this quick guided tour. But if you decide to study the Bible more seriously, you may soon want to buy a new Bible. Buying a Bible used to be as easy as buying a Model T Ford — you could have any color, as long as it was black. Today, the religious section of your local bookstore (or an Internet supplier) has a bewildering array of Bibles. Which one is right for you? Each of the many versions of the Bible has its strong and weak points. Some Bibles are translations, while others are paraphrases of the original languages. It is important to know the difference. A paraphrase attempts to render the ancient Scriptures in clear, modern, lively English. However, sometimes this clarity is achieved at the expense of literal accuracy. A translation tries to stay closer to the wording of the original languages, even if the result sometimes sound a bit awkward to today’s readers. And there are some versions that try to achieve a balance between translation and modern English. If you want a sound, reliable Bible for everyday use, we recommend that you choose one of the popular, readily available modern translations. The King James Version has been with us since 1611, and is often called the Authorized Version, because it was authorized to be read in English churches. It is still widely sold and widely quoted. Its language is sometimes majestic and sometimes rather old-fashioned. Unless you are already familiar with the thees and thous of Elizabethan English, you will probably prefer a more modern version. The New King James Version was published in 1983. It preserves much of the style of the King James, but has modernized the language. Modern readers will find it easier to read and understand. The New International Version was published in 1978, updated in 1984, and again in 2011. Clear, readable language and helpful subheads and footnotes make the NIV suitable for the new Bible student. It is popular among evangelical Christians. The New Revised Standard Version was published in 1989 by the National Council of Churches. It is based on extensive scholarship and is common in larger denominations. 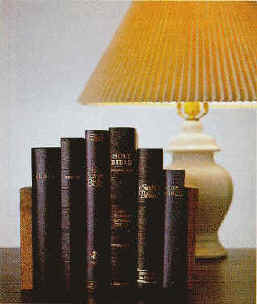 The New American Bible was published with an updated New Testament in 1988. This Roman Catholic translation also includes the Deuterocanonical books (see below). The Contemporary English Version was published in 1990 by the American Bible Society, using the methods they use to translate the Scriptures into the everyday speech of peoples around the world. The result is an easy-to-read version that avoids theological jargon. For beginning readers, an inexpensive Bible will be suitable. More serious students may choose a leather-bound Bible with wide margins, or a study edition that includes background notes and comments. Besides Bibles, you will see in the bookstore many reasonably priced Bible study aids. As you become more familiar with the Bible, you may want to buy some of them. Two or more translations of the Bible may be helpful for comparison. Commentaries give a book-by-book, verse-by-verse explanation. Some are easy for beginners to use; others are scholarly works that discuss Hebrew and Greek terms. Many Bibles and reference works are also available on computer. These may range from free downloads to 400-dollar libraries on disk. But most of them are designed for detailed work by scholars who are already familiar with the Bible itself. The Bible is the world’s best-seller. Both of these suppliers offer printed catalogues, if you prefer. 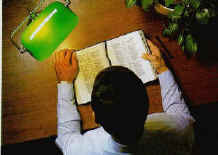 Many smaller suppliers also offer a variety of Bible translations and prices.